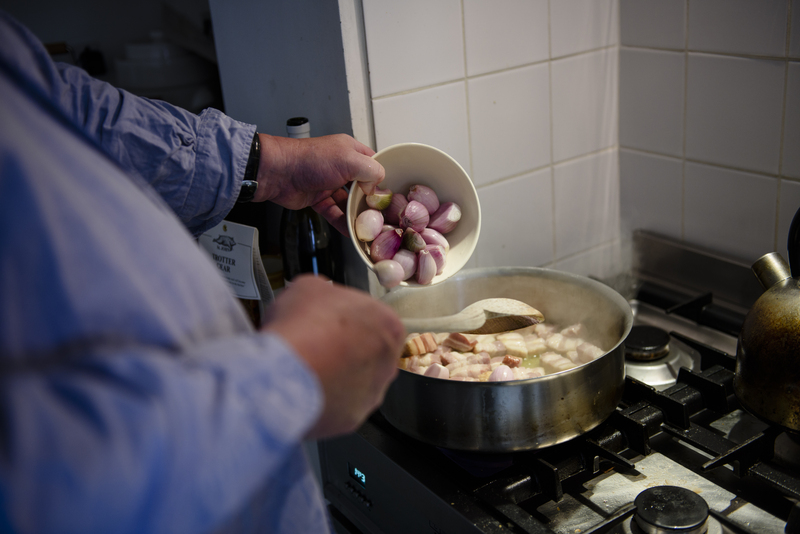 Learn the basics of this fatty, indulgent comfort food from England's "King of Offal." 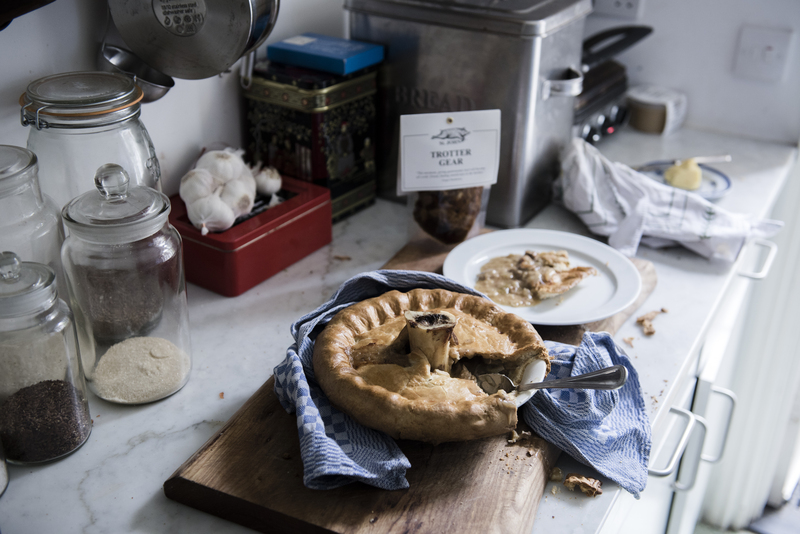 Savory pies are the epitome of proper, old-school British home-cooking, harking back to a time when an edible cooking vessel was a surefire way to make a disparate bunch of ingredients look more appetizing. They also hit the universal qualities of comfort food all over the world: rich, fatty, and bubbling right up until they hit the table. 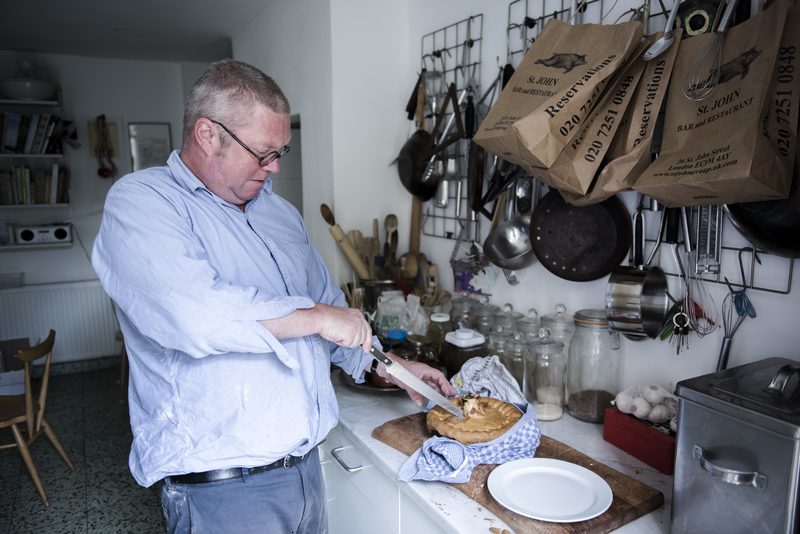 While not particularly prominent in America, savory pies are firmly ingrained in the food memory of Britain, and specifically in that of Fergus Henderson—the offal-loving Godfather of meat. 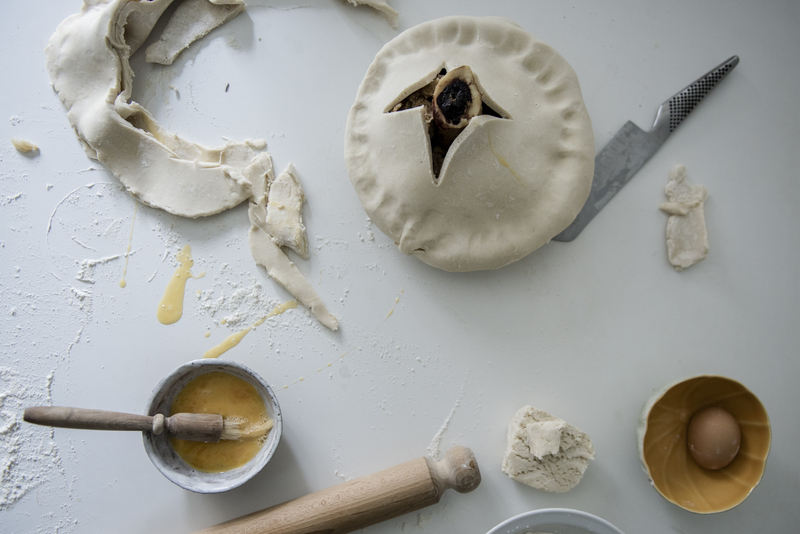 The base joy of a good savory pie is in its simplicity: It’s about a filling that’s as flavorsome as possible, and pastry that’s hopelessly, gloriously indulgent. 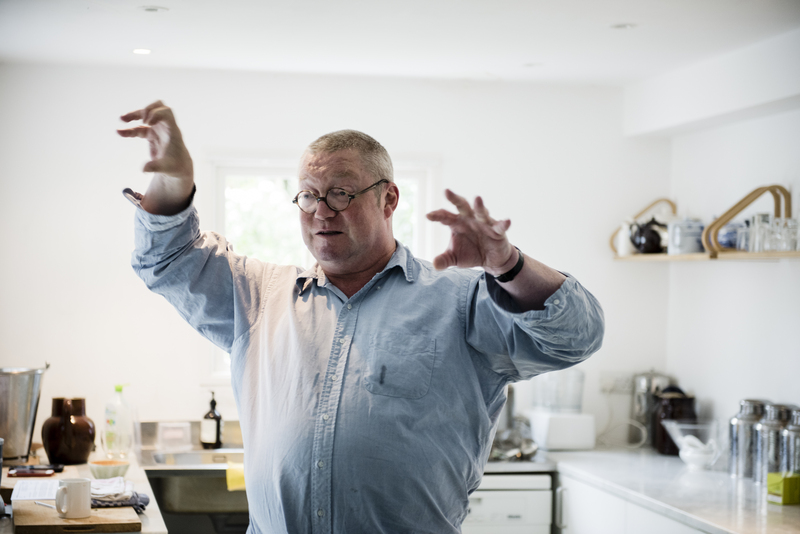 Weird ingredients are key to achieving both of these, and leave it up to Fergus—whose legendary London restaurant St. JOHN was, by some, “accused of being 200 years out of date” in its early days—to irreverently remind people of that. Good pastry should not be healthy in the vaguest sense. It’s about the most rich, fatty, and indulgent way to wrap something up, and to do it properly, you need suet—the tough, pale-white, pure fat found around the kidneys of beef and sheep. 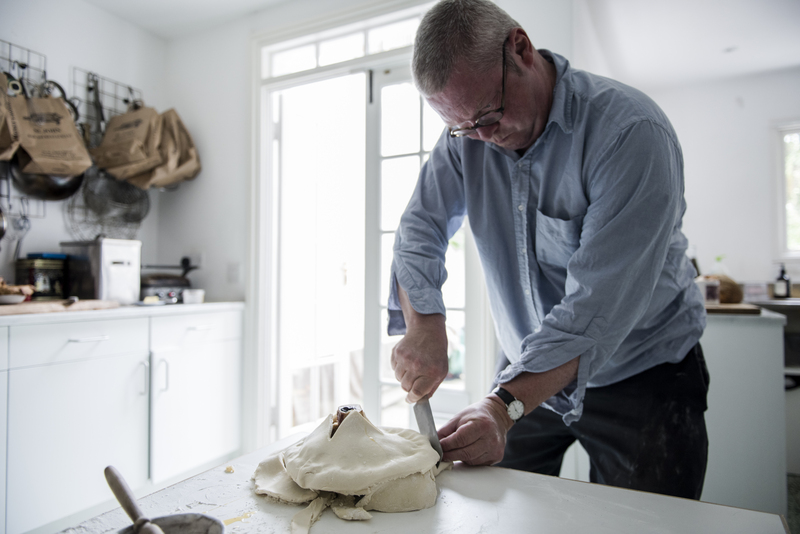 Suet pastry is “pure joy” according to Henderson. It's extremely old-fashioned, “but modern at the same time," he says with a smirk. Suet is available from butchers everywhere, and some supermarkets. "If your butcher doesn't have it,” says Henderson, “they'll be able to get it. Just phone your butcher. And hug your butcher." 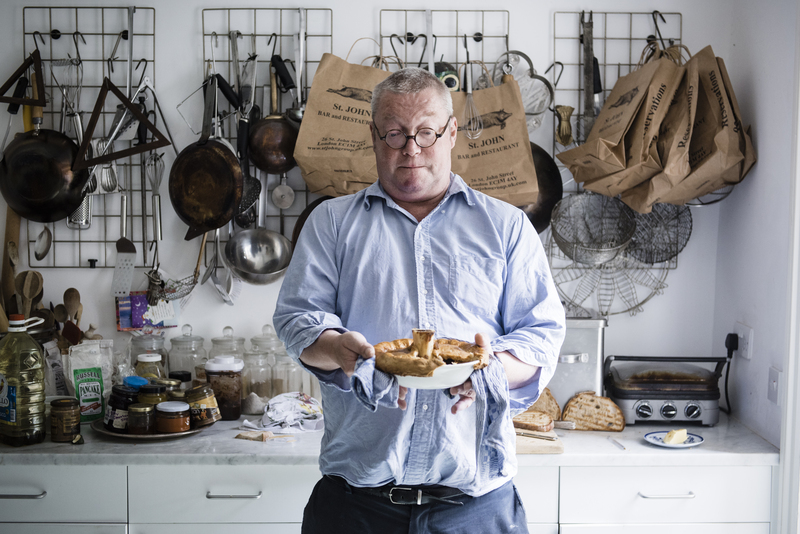 As for the filling, it’s about making the richest, stickiest, loveliest meat stew you can imagine, and while good meat, slow cooking, and proper seasoning are all important players in this, Fergus swears by a secret weapon: Trotter Gear. Fans of Fergus will likely remember the bizarre phrase from his revered first book, Nose to Tail Eating: A Kind of British Cooking. 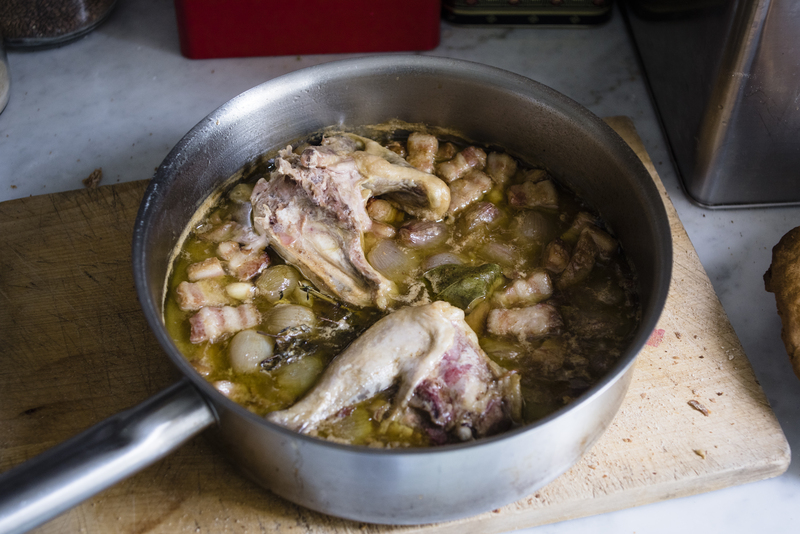 It’s fairly straightforward, really: a dense stock full of the dark meat around pig’s trotters that “councils meat through the traumatic process of cooking” and turns it into something “unctuous." Due to the fairly lengthy preparation process, St. JOHN is now selling it in pouches for the home cook. 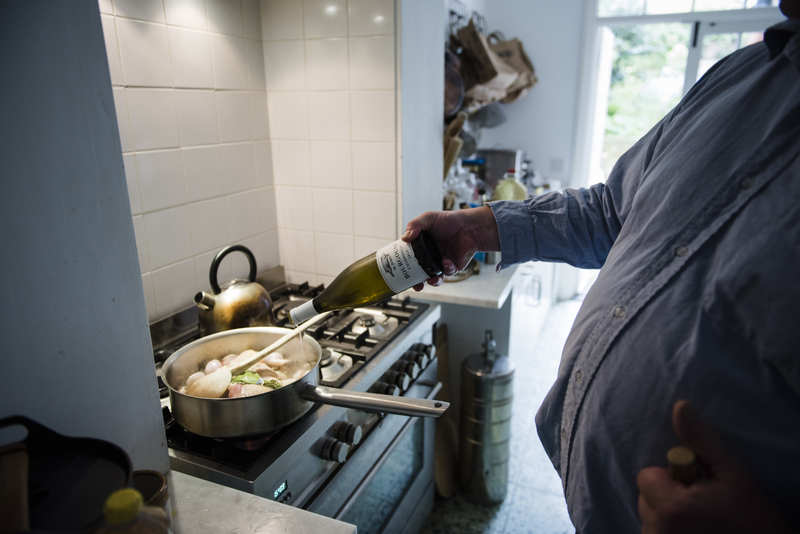 “The difficulty of cooking trotter gear at home is that de-fleshing trotter is a pretty labor-intensive process,” says Henderson. A pig's trotter is like a hand, with knuckles and everything inside the fleshy sheath. If you're unable to get ahold of Trotter Gear, then store-bought veal stock will make a suitable replacement. 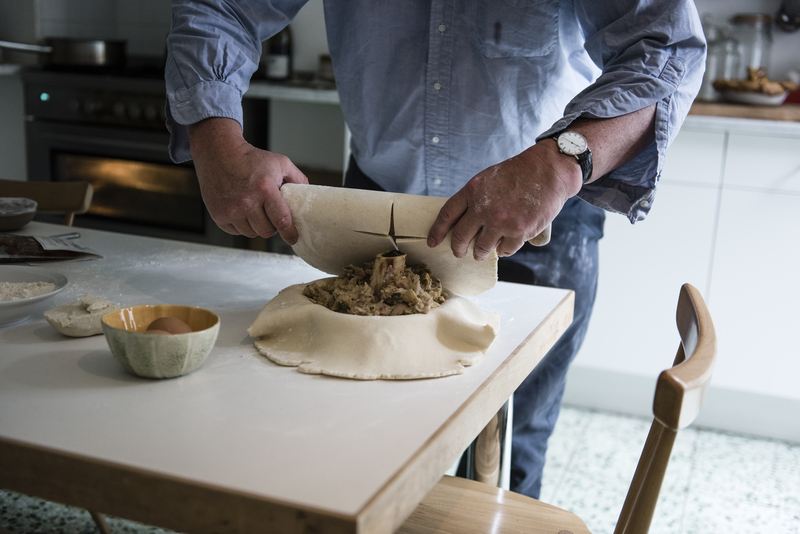 Without further ado, here's how to make a classic British savory pie with legend Fergus Henderson. 1 bird, jointed—use either a guineafowl, a small chicken, a pheasant, or a large-ish pigeon. A rabbit works well, too. The filling comes first because it takes the longest. 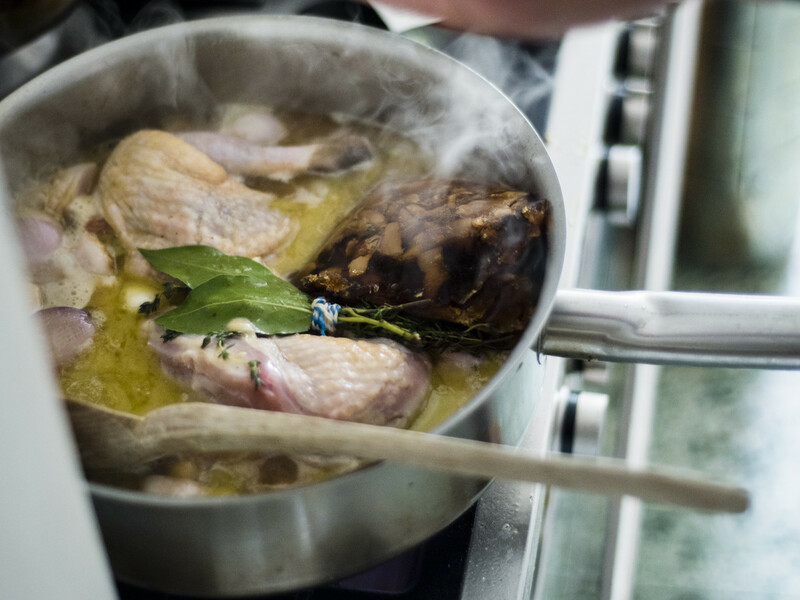 Begin by getting an oven-proof frying pan hot, adding a knob of butter, and browning the whole or jointed bird over a medium flame. Do this for three or four minutes on each side, until the surface is golden in patches and sizzling. (In this case, guinea fowl, but chicken is a fine substitute). “Guinea fowl is more flavorsome than chicken," says Henderson. “It has a tendency to go dry—but that's where trotter gear comes in handy." 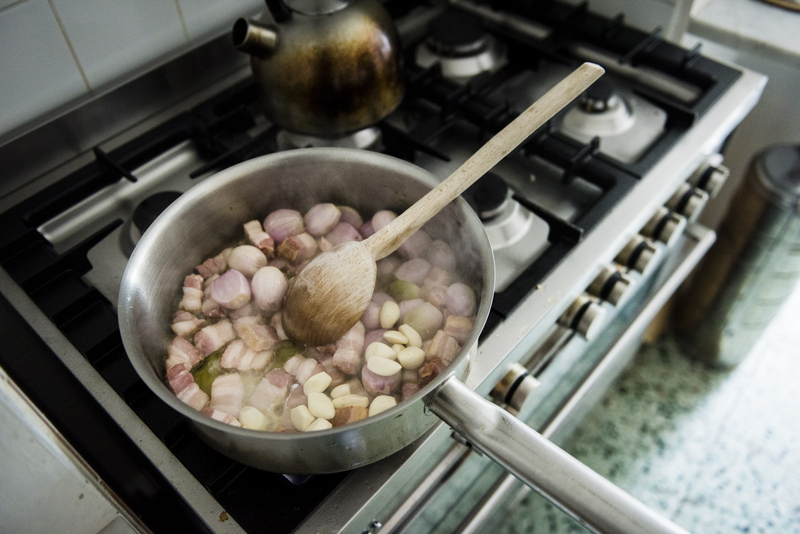 Then, remove the meat and fry off the base ingredients over a medium flame for five minutes (that’s half-thumb-sized pieces of thick-cut bacon, and whole shallots and cloves of garlic) in butter or oil until everything is “pleasingly pale golden." When the bird goes back in, it’ll do so along with generous glugs of "whatever white wine is in the fridge door", and a tied-up bunch of fresh thyme (a trick to "stop them being like toothpicks" at the end) and bay leaves. From here, a couple of ladlefuls of chicken stock go in before the trotter gear (or veal stock from your local grocer) is added. Put a lid or tinfoil over the pan, and pop in the oven for around 45 minutes. If that sounds rough, it is—just make sure it’s “covered, and a medium temperature,” as Fergus says. “Ovens in people's home are always totally different,” he explains, “so if you go with directions like hot and medium at least you have a rough idea of where you are." Once this is ready, let cool and remove the bones, and refrigerate for 12 hours. 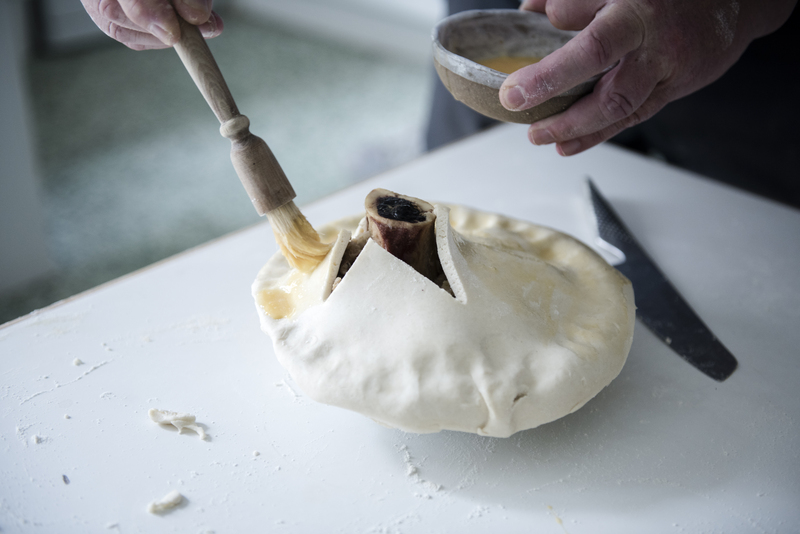 It’s essential that the filling goes into the pie cold so as not to "play havoc with your pastry." 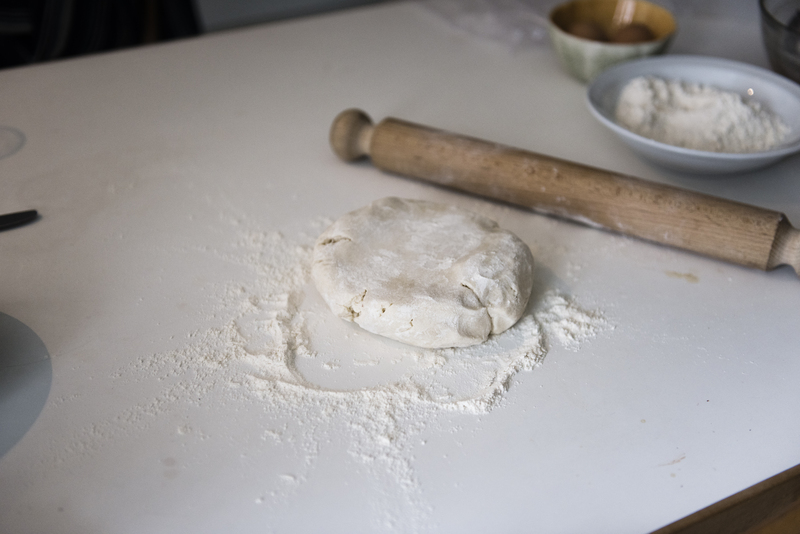 While your filling cools, get your pastry together by mixing together flour, suet, and sea salt, and then add water “cautiously, a tablespoon at a time” until you achieve a firm dough. “You want to work it as little as possible,” says Fergus. Make sure to let it rest in the fridge for a couple of hours. "It should be cold,” he comments, but as long as you’ve done that, “it's quite forgiving. Behaves itself well. 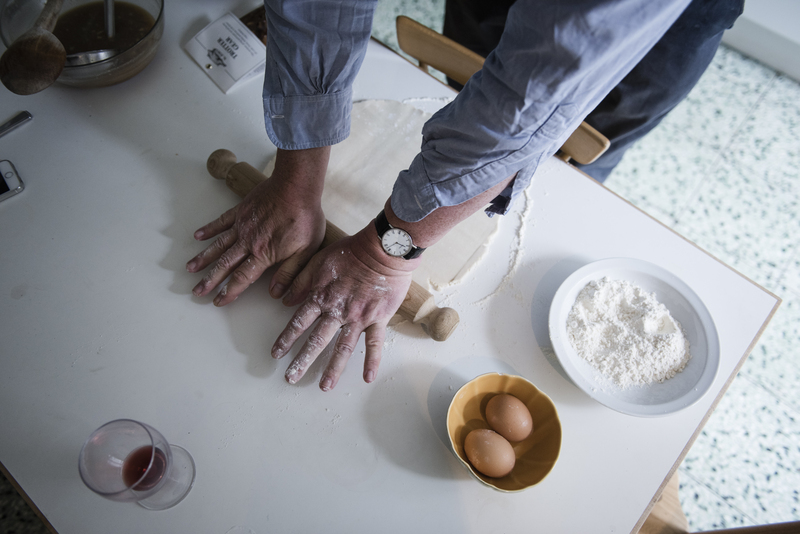 In the pastry world, it's friendly, useful." You’d think it’d go totally soggy, but “that's the joy of suet pastry,” says Fergus. “It's basically a pudding, and gets a slightly squidgy bum. I'm very much into a soggy bottom." Pick out a reasonably deep, round dish that has “enough space to get enough pie mix into the pie, so the bottom and top have enough going on between them." 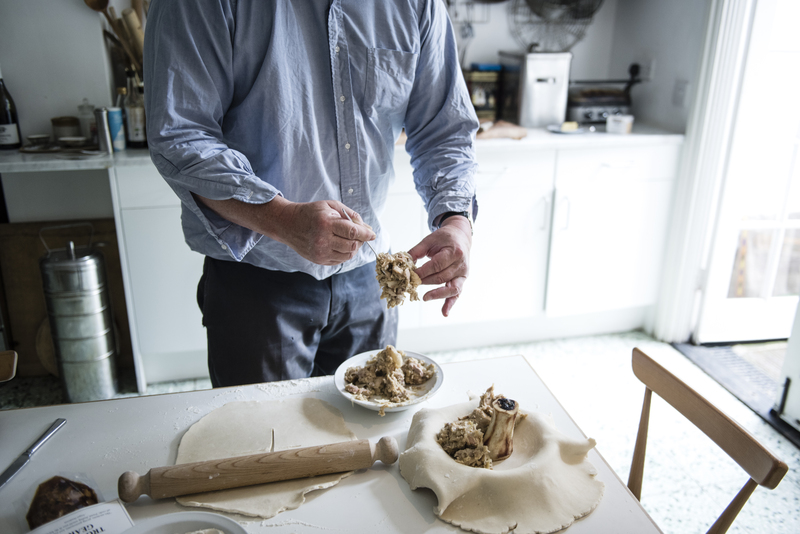 Fergus centers his pie around a decent chunk of roasted veal shin-bone, the marrow from which can be scooped out and eaten with the pie. Any reasonably hefty bone can be used, but as Fergus says: “Bones are erratic, so you have to judge [the roasting time] based on the thickness." Roast until the marrow begins to separate from the bone; 20 or so minutes in a hot oven should do it. This, too, needs to be cooled before going anywhere near the pastry. 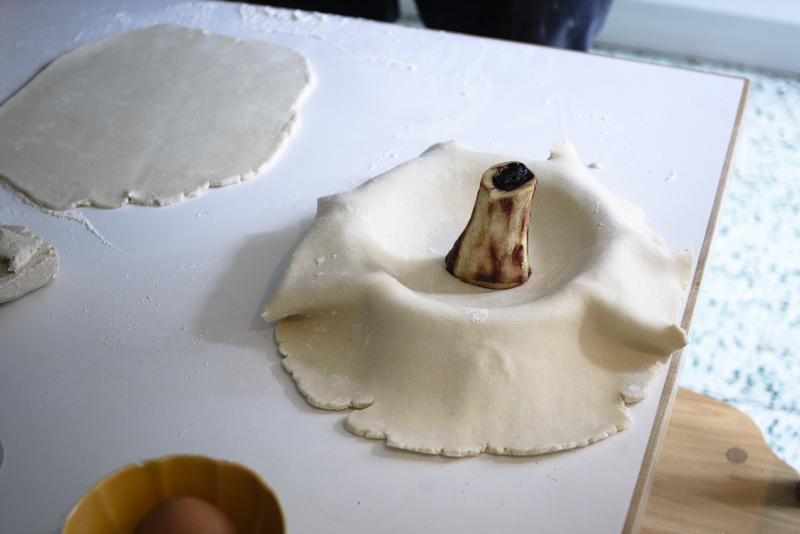 Press the pastry into the bottom of the dish, and arrange a generous amount of your cooled filling around the bone. Then, cut a big cross in the middle of the second round, and lay carefully over the top. Seal the top and bottom with a beaten egg. After you’ve crimped down the sides with your thumbs, roughly trim the sides, leaving “a lot overhanging” around the sides, to go crunchy and brown in the oven. 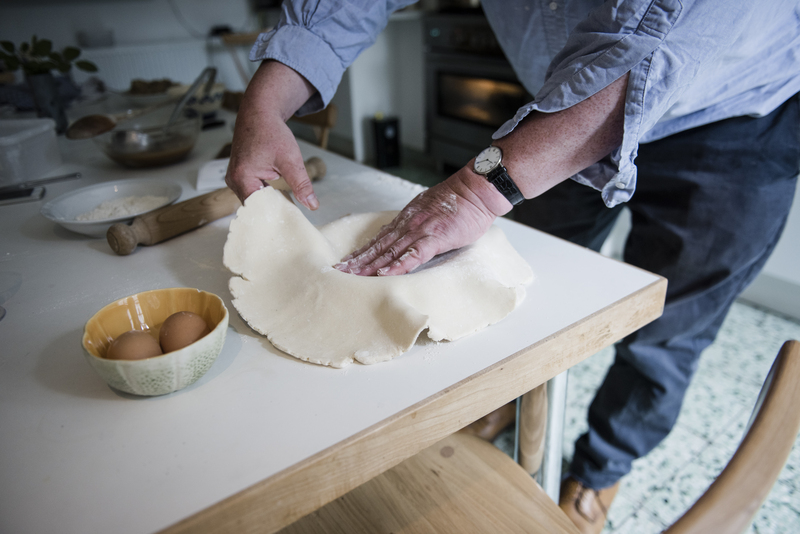 Words like “rustic” needn’t be thrown around when it comes to pies, because according to Fergus, because they’re imperfect by nature. “You can use a lot of intuition,” he says. Spread the rest of the egg over the top for “a glamorous sheen—it’s all about high glamur”. 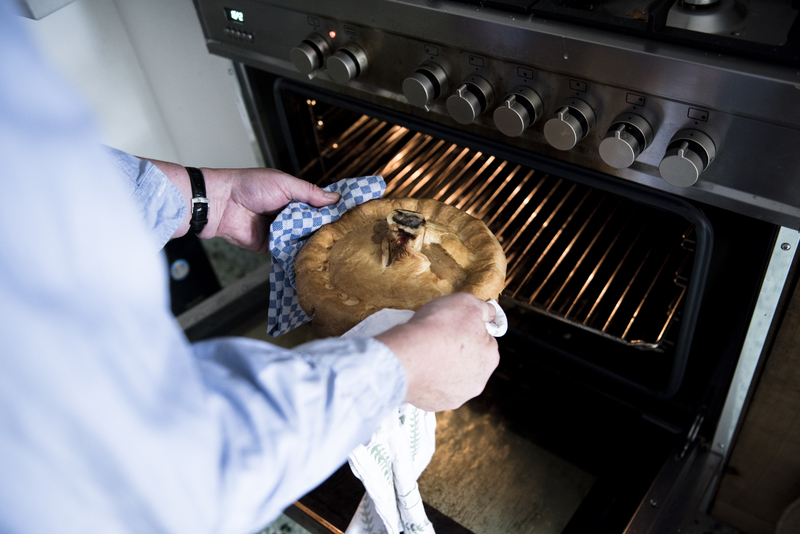 ...before sliding it into the oven at a medium temperature for approximately 1 hour. 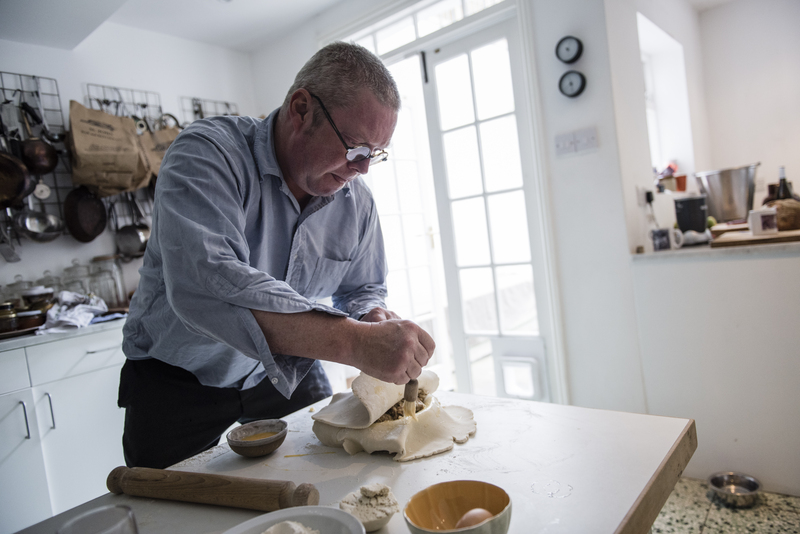 “Take it out when it’s golden and brown and bubbling,” says Fergus. Serve “with mash! Mashed potato works really well with pie. Greens, cabbage...and red wine.” It also doesn't need gravy because it's all in there.